Here is a free resource to family history buffs and enthusiasts alike. The Ancestral Findings Website provides several links to various data collections that are sure to please those searching for their roots. Also nestled into this site links to learning sites for various ethnicities, religions, locations, etc. 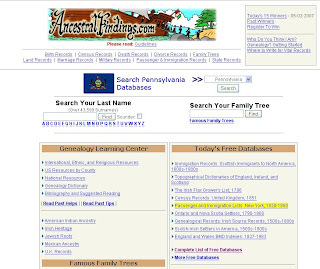 The information on this website is free in general, but at times, you will be linked to subscription sites such as Ancestry.com and Genealogy.com. Overall, I think that this site is worth taking the time to browse through to find information on your ancestors. The volunteers for this site are happy to do lookups for you, but please adhere to the rules that they have set forth in requesting assistance. Click here to see the guidelines for requesting help. The following link will take you directly to the database holdings for this site. Click here to view the site and see what it has to offer. Please note that sometimes when you click on a link, you will be asked to provide your email address, the name you want searched, and any pertinent information regarding the individual. Have fun!